315 feet high, diam. 20 feet. No traveller from the East should fail to visit one or the other of the groves of “Big Trees”; the principal ones are the Calaveras and Mariposa, the property and the charge of the State of California, to be held as public parks forever. These trees are the highest and largest of the vegetable kingdom, both dimensions considered; though some of the eucalypti of Australia are 100 feet higher, and the baobab of Africa is larger in diameter, the former is of comparatively small diameter, and the latter of medium height. 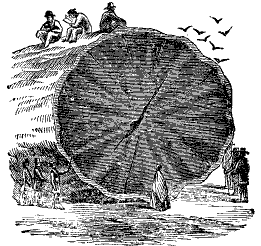 We are familiar here with the wood and bark, and even the cones, seeds and foliage, from a large specimen recently exhibited in the principal cities and towns, and which, it is hoped, may ere long find a permanent resting-place in Boston. 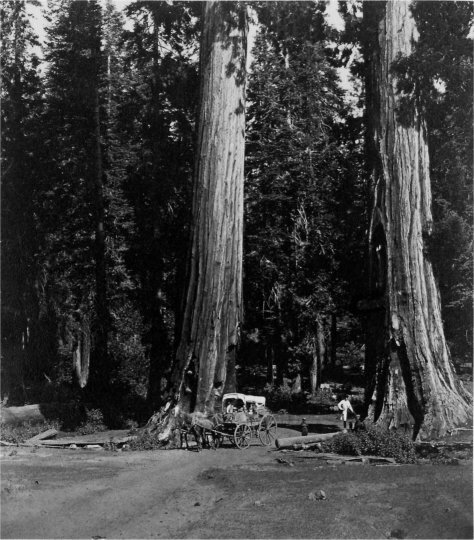 These huge trees are said to have been accidentally discovered in 1852 by a hunter employed by a mining and water company, whose story was so little believed that he was obliged to lure the workmen to see the trees, by leading them to a huge grizzly bear which he said he had killed, and was unable to bring in alone. The wonder soon got into the papers, and was quickly known all over this country and Europe. Dr. Lindley, failing to recognize its genus, named it “Wellingtonia gigantea,” after the greatest modern English military commander; it had already been called in America “Washingtonia gigantea,” in compliment to our noblest military hero. Decaisne, a French botanist, discovered that it belonged to the same genus as the California redwood (Sequoia sempervirens), and it is now known in science as S. gigantea. The genus was named in honor of Sequoyah, a Cherokee half-breed, better known as “George Guess,” who lived in the last quarter of the 18th, and the first third of the present century. He dwelt in the north-east corner of Alabama, and invented for his tribe an alphabet and written language; there were in it 86 characters, each representing a syllable. It was considerably used, and a paper was printed partly in these characters. The memory of this benefactor of his people will probably soon pass away with his nation, now driven beyond the Mississippi, and rapidly becoming, exterminated. The redwood, so called from the color of its wood, is limited to the seaboard, seeming to require for its growth the salt mists from the ocean. The “Big Trees” are inland, and confined to limited ranges in the Sierra; but both are Californian, and the latter entirely so. The genus is also found fossil in the earlier “tertiary” of Greenland, as high as lat. 70 deg. N.; the study of these giants, therefore, is of great interest to the palaeontologist and geologist. The redwood is found along the coast from 36 deg. to 42 deg. N. Near San Francisco and the large towns they are all cut down; but in other places they constitute forests 100 miles long and 10 to 15 wide. They are almost as grand as the Big Trees themselves, being 50 to 70 feet in circumference, and 275 feet high; they form the entire forest (the Big Trees occurring in groups or groves among other trees), presenting therefore a grander sight, with their straight trunks without branches for 100 to 150 feet. The contrast of the cinnamon-colored trunks and the deep green foliage, shutting out the sunlight above, with the gloom and absolute silence of these majestic groves, prepares one to expect processions of ancient Druids emerging from these stately avenues, and to come upon some previously-undiscovered Stonehenge in these magnificent solitudes. The “Sentinels,” about 50 feet in circumference, and 275 feet high, stand guard at the entrance of the grove, like giants at the portal of an enchanted palace; and between them, with head uncovered, you pass into this grand temple of nature. The Mariposa Grove, about four miles southeast of Clark’s Hotel, is also in a depression, accessible at present only on horseback or on foot. The grove is about two miles square, and its trees are more numerous, less lofty, but larger, than those of the Calaveras Grove. Many have names prominently affixed to them, taken chiefly from Americans famous in politics, science, literature, and especially poetry. 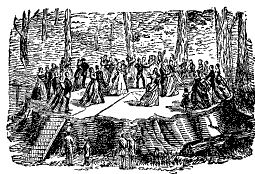 Almost all are burned at the base, probably accidentally, by the Indians, and many have large cavities thus made in their standing trunks, through which you ride on horseback, and in which a large party could be protected from a storm. Many little trees are growing all around, from two to one hundred feet high, and there seems no immediate danger of the species becoming extinct, especially as the groves are guarded and protected with the most jealous care by Mr. Galen Clark, the State Guardian. 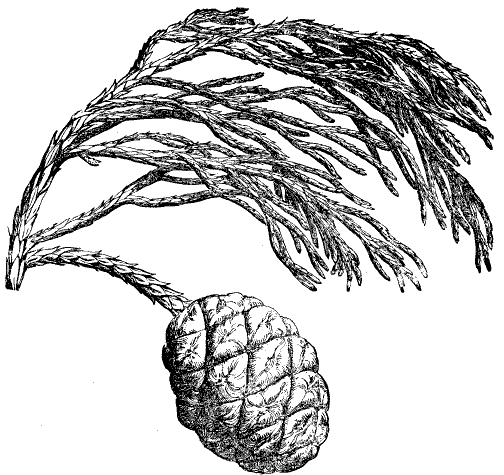 The first branches are given off at so great a height that it is difficult to obtain fresh specimens of the foliage; the cones are not more than two inches long, while those of the sugar pine, a large, but much smaller tree, are one and a half to two feet in length; the seeds are very small and light, a germinate readily in the East, and in Northern Europe; many are growing in this city and vicinity from seeds obtained and distributed by me last year; they grow with considerable rapidity, even two feet in a year, and form beautiful and interesting parlor ornaments. The foliage is somewhat like that of the arbor-vitae; the bark smooth, porous, light, and cinnamon-colored; the wood red, as in redwood, light, spongy, and of not much use in carpentry. The largest tree in this grove is the “Grizzly Giant,” ninety-three feet in circumference at the base, familiar to many by excellent stereoscopic views; the top is broken off, and it is evidently very old and declining. THE CONE, AND FOILAGE OF THE MAMMOTH TREES—FULL SIZE. There are several other smaller groves, not generally visited by travellers. The species, therefore, can hardly be called a rare one, nor can it be said to be dying out. Though less high by one hundred feet than some Australian trees, and less in diameter than the African Adansonia, yet, taken altogether, it must be regarded as the grandest type of the vegetable world.